(Newser) – The old-school arcade game of pinball is resurging in popularity. The AP reports interest has skyrocketed over the last decade, with the number of players and competitions growing worldwide, per the International Flipper Pinball Association. There were 500 players in 50 competitions worldwide in 2006, according to the IFPA; in 2017, there were 4,500 competitions and 55,000 players. "Pinball is not going away," says Zach Sharpe, a rep for the world's leading pinball manufacturer, Stern Pinball, in the Chicago suburb of Elk Grove Village. "It can't be replicated and I think that's why it never truly goes away." The first game ever patented was in 1871, but access to games stalled from the 1940s through the 1970s, with some cities banning pinball because it was deemed to be gambling, according to Roger Sharpe, Zach's father, who wrote the book Pinball! The elder Sharpe is known in the pinball world for convincing the New York City Council the game is more skill than luck, leading to a lifting of the city ban in 1976 and spurring the removal of similar restrictions elsewhere. Popularity has ebbed and flowed since. But Zach Sharpe says his company's revenue has shot up of late: In 2017, revenue grew 30% over 2016; 2016 was up 40% over 2015. He attributes some growth to smartphone apps that show enthusiasts where to find pinball machines. 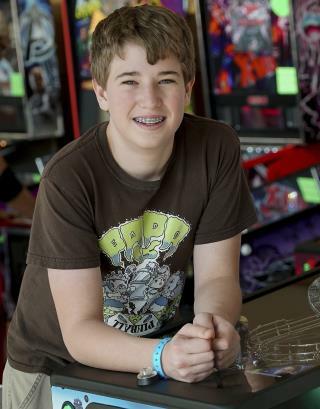 The game attracts all ages, including 14-year-old Escher Lefkoff, who at 13 won the Professional and Amateur Pinball Association's championships last spring. Escher's dad, Adam, also a ranked player, says the game teaches his son life lessons. "The ball is going to drain," Adam Lefkoff says. "That is inevitable. It's important what you do while the ball is in play." Every hotel in America over 50 rooms should be required to have one. In the 90's, Pete Townsend came to a radio station parking lot in LA and played "Pinball Wizard" and other Who hits for the lucky few hundred of us who attended. He stayed a good hour, afterwards, and signed autographs. He even smashed (on request) a fan's acoustic guitar. I picked up a piece of it, which fell at my feet, and he signed it. I never stopped playing arcade pinball and my 10 y/o loves playing it too...these games are timeless...I found an arcade a few years back that has over 100 of these games you can play...amazing!